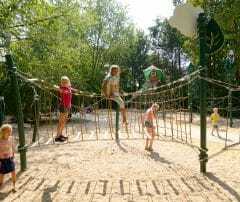 Here you will find answers to many ques­tions regard­ing play­grounds and ropes. If you did not find answers to your ques­tion, please con­tact us and we will help you. 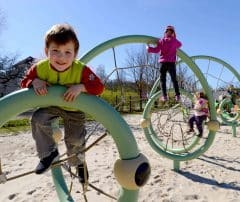 Is high rope play equipment dangerous? 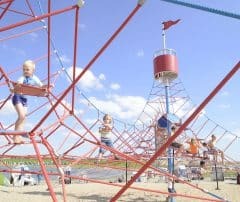 To the contrary, accident statistics prove that rope play equipment is among the safest play equipment of all. 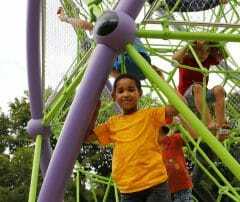 If rope play equipment is designed and manufactured professionally, it is no more dangerous than other play equipment. The geometry of the net prevents everybody from falling through from the top of the structure to the ground. For example our giant rope pyramid Neptun XXL is extremely impressive with its height of more than 9m (29 ½ ft) , but at no point is there a free fall risk greater than 1.8 m (6 ft.). According to accepted standards, even 10 ft would be acceptable with the right safety surfacing. 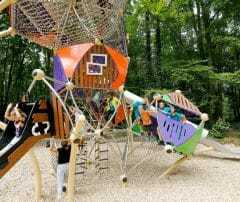 Thanks to the spatial structure and specially designed rope elements; a falling child has the opportunity to stop their fall safely and quickly by holding on to a rope. What kind of safety surfacing do I need? In most of the cases safety surfacing made of loose material, sand, wood chips or gravel is used. To even cover the maximum of allowed free fall of three meters, we recommend you to install a layer of at least 40 cm to make sure that in the case of failure of maintenance there is enough sufacing. Our standard foundation parts also match this depth. Synthetic fall protection in the form of rubber tiles or rubber surface has different installation depths depending on the producer. They depend on the HIC tests for fall protection areas. We would be pleased to adapt our foundation parts to the system chosen by you. 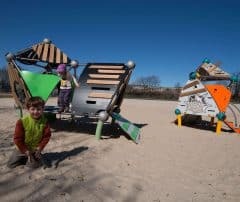 How much space is needed for your play equipment? In addition to the dimensions of the equipment, you need safety area specified for the equipment of your choice. It amounts at least to 1.5 m (4’9”) from the outer edge of the equipment. 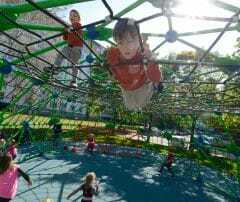 Does your play equipment comply with the standards? All products of Berliner Seilfabrik are constructed based on their place of installation, and in accordance with the European standard EN 1176, the American standard ASTM F1487 and the Canadian standard CSA Z614. Our system for quality assurance guarantees a compliance with the standards. 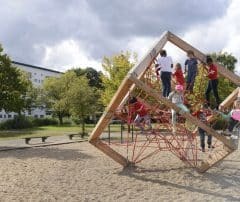 Which areas does a playground need? 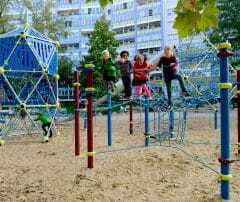 When planning a playground you should identify the target group and then choose the adequate equipment. At the same time you should also consider different patterns of movement and playing. On climbing equipment children can have a good time, train their sense of balance and stay fit. Other moveable equipment, like rotators, cable rides or swings, are always a good match for all age groups. 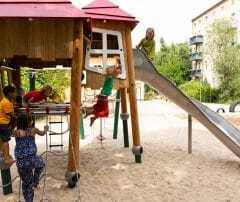 In the case of smaller children you can also provide for role play equipment or sand areas. Also important are areas for relaxing or benches in the shadow for adults. I have a special idea, how can we proceed? Even if you don’t find your idea in our catalogues, this does not pose a problem. Endless ideas, from the lobster of Büsüm to net landscapes on slopes, all this can be realized with steel pipes and ropes. Just send us your draft or a little description and we will do our best to bring it to life. Many or your products do not specify directions for play. How do children know how to play with the equipment? That’s one of our equipment’s greatest assets. Various studies show that free playing, without many instructions from adults, creates the most benefit. Unlike other playing concepts the spatial nets initiate a cognitive process in the playing child. The ability to make decisions is trained in a playful way. We have 31 standard colours for pipes, posts and balls from which to choose. We can also provide even more colours, for an additional charge. You can choose from 13 different colours for the ropes. Of course, we can combine several rope colours. Can you build constructions on slopes? Yes, for our Terranos/Terranova systems this is easy to accomplish. Please have a look at these two examples: Terrano 1893, Copenhagen.02. All we need are the measures of the slopes and then we can provide a proposal. 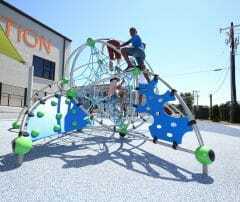 Can you install play equipment on rooftops? This is possible for most of our equipment, however it will depend upon the roof system. Rooftop examples can be viewed here (Tolosa) and here (Copenhagen.01). Can we install equipment without fall protection? 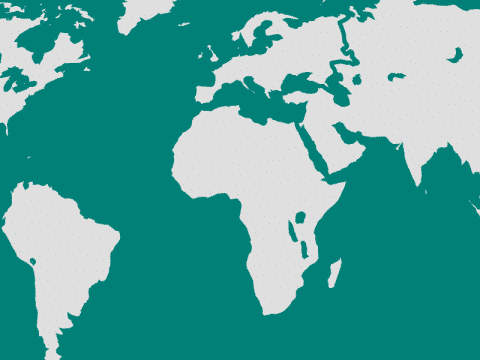 Yes, equipment without forced movement and a fall height of less than 60 cm (2 ft), can be installed without safety surfacing within the countries that follow the EN standard . Whole landscapes can be designed using this equipment. I am planning to build a playground which is challenging for all ages. Do you have equipment for this idea? Larger rope play equipment, e.g. our over 7m (22 ft) high Pegasus, seem to not only inspire kids but adults to play as well. 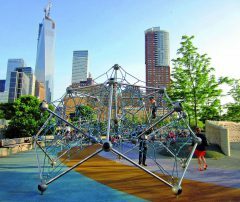 Whether it’s the fitness aspect of climbing, or the athletic race to the top against your granddaughter, the “skyscrapers” among the play equipment are a good start. The low ropes course with sportive elements could be another approach. Of course, we can also provide you with customized concepts and ideas that meet your specific needs. Do you also offer equipment without barriers? Yes. Most of our playing elements have a very low access height and are therefore easy to reach directly from a wheelchair. A swinging net, as used in our Cloud 9, or special swing seats for disabled individuals can be used for swinging. Aren’t isolated climbing pyramids boring, as it’s just one activity – climbing? 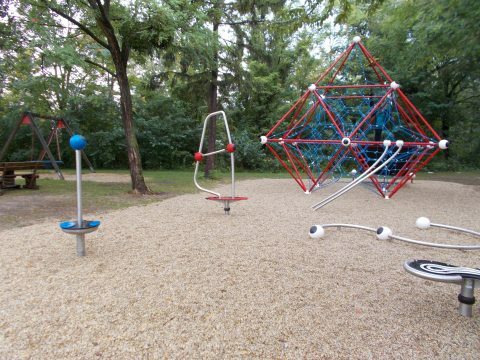 When choosing your play equipment, quantity should never be the only criteria. Thanks to their complexity, spatial nets offer an unmatched level of playing quality. 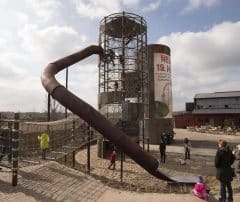 Imagine a 3D surrounding made of ropes, sixteen feet above the ground; climbing, jumping, balancing, seesawing all become an exciting, surprising, playing universe that can be enjoyed again and again. What are your ropes made of? In the inside of the rope there is a steel reinforcement – this is the rope’s soul. On the outside there are 4 or 6 strands, which themselves consist of a steel core, covered with polyester yarn. All ropes are manufactured at our facility in Berlin. Our rope has the highest abrasion and colour fastness of playground ropes available worldwide. Why is your equipment so expensive? 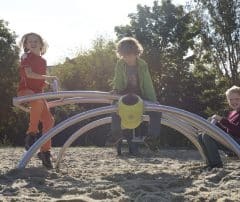 When you consider the lifelong costs associated with all play equipment, our equipment is not as expensive as you think. Our products last longer and require less frequent service and repair. In addition, the compact spatial nets require less space for installation which translates to savings in surfacing costs. Installation of our equipment usually costs less due to the reduced costs of foundations. If you analyze the complete price and compare it to the prices offered by our competitors, we score quite well. And this is without giving consideration to the additional play value and the attractive aesthetics of our equipment. 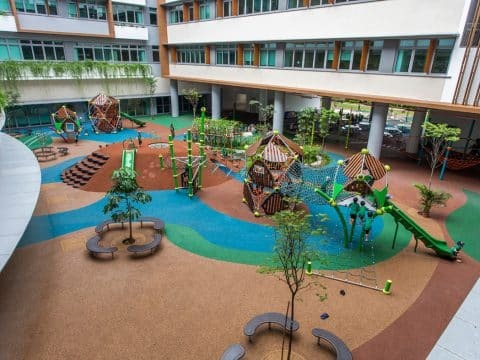 Where do I get the product information and specifications for my playground design from? You can stick to our data sheets, which are available for download from our product site. If it is a customized project, our staff will surely help you. How long is the durability of your equipment? 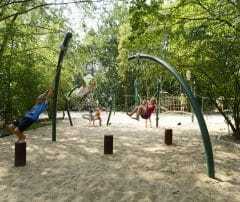 As long as the rope play equipment is properly maintained, it will last for decades. We have numerous rope pyramids dating back to the 70s, which are still being enjoyed today. It is relatively easy. With over 20 patents, Berliner Seilfabrik provides the operator with key technologies, which minimize the effort for service. Can’t you simply cut the ropes with a knife? All the ropes we use are steel cables covered with yarn. The steel wires inside assure that cutting is impossible. Rope play equipment has a reputation for being vandalism proof and is therefore also used in big metropolises. If a rope is damaged, do we have to change the whole net? No. Thanks to our patented 3D-braiding system with a cloverleaf ring, defective ropes can be removed and replace on site and without special tools. The climbing pyramids do often look very complex. How complicated is the installation? It’s surprisingly easy. The spatial net, even if it consists of single ropes is delivered as a unit. It only needs to be hung into the already prepared framework. For a medium-sized piece of equipment you usually do not need more than two days, including the concrete footings. Do you need installers certified by the manufacturer? No. As long as you comply with the installation instructions and principles typical for industry, a correct installation is assured. We have even had groups of Boy Scouts, who installed play equipment under professional guidance.